Here, you will find the Overlay Shield Buckles. 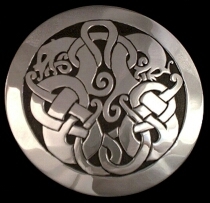 Designs range from Viking to Celtic and Magyar. Custom designs are also welcome! Epona is a Mother Goddess revered by the tribes of Britain, Gaul, Ireland, and Scotland as well as by the Roman Calvary. Restoration, Rivers, Springs, and Spiritual mastery. She is often depicted riding a Horse. 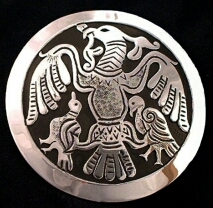 The great mythical Turul Falcon is one of the most important symbols of the Magyar. 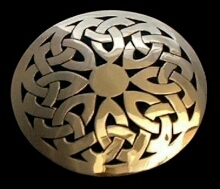 It represents the power and will of god. Turul is the bird of the origin myth of the Magyars who sits on top of the Tree of Life along with the other spirits of unborn children in the form birds. Torgul or turgul means peregrine falcon. In Asian legend the Turul brings the priesthood first to the woman Emesh and her son by causing her to be fertile. They and their descendants are the first priests (KHAM), who can read the will of god from the heavens and stars. 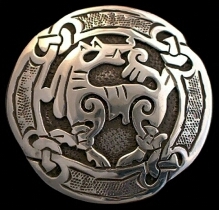 The Turul is also the symbol of the house of Atilla as well as the Árpád dynasty kings of Hungary. 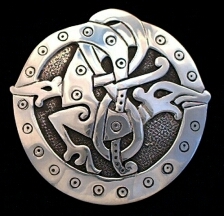 On Page 1 of Belts are Viking & Anglo-Saxon Belt Sets with a special section for large & hefty Bronze Belt Sets. There are Buckles, Mounts & Panels with a subsection for the Oriental Belt Mounts, as well as Bag Mounts. This is Page 2 of 2. Go to Page 1. Overlay is a specialized technique used to handcraft individual pieces of jewelry. To begin with, the design is pierced out of a metal sheet, which is then fused, soldered or riveted to a previously stamped second sheet of metal. Additional details are crafted in by hand and then the finish work completes the creation. Overlay examples can be found as early as the 5th century BCE, when overlay was preferably riveted together, instead of the two sheets being fused/soldered. 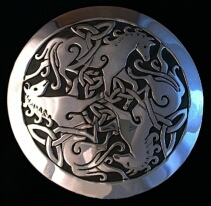 Our overlay is done using two layers of heavy gauge Sterling Silver (unless otherwise requested). We usually finish these pieces with a mirror like surface, but also offer a more modern brushed look. Many custom designs are easily converted into overlay cut-outs. Please inquire! 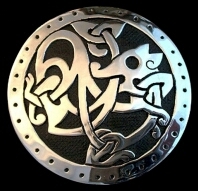 Overlay Shields can also be turned into Brooches or Pendants! Photos may not reflect actual size.